Why Is Wind Turbine Fabrication a Job of Tomorrow? Wind power, and thus wind turbine fabricators, will be sought after to help power homes and office buildings in a more environmentally conscious way. Wind power has experienced an annual growth rate exceeding 30 percent, according to the American Wind Energy Association. That trend is expected to continue well into the next decade. Experienced wind turbine fabricators earn an average of $21.30 per hour, according to PayScale, a company that specializes in compensation data. What Does a Wind Turbine Fabricator Do? 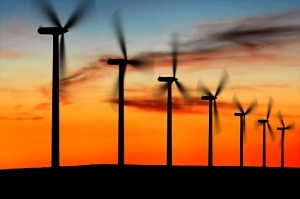 Wind turbine fabricators are responsible for designing and installing large wind power units. They must take into account how much wind an area receives before installing a turbine. Turbines are often located on open locations with few physical obstructions so that the maximum amount of wind will be hitting the turbine, turning its blades and producing clean energy. Most turbines are located on the tops of hills, across a flat field or offshore. What Kind of Training Do I Need to Become a Wind Turbine Fabricator? There are no formal education or training requirements for wind turbine fabricators, though earning a two-year associate degree in engineering would help an individual perform better than those without an education. Previous construction and engineering experience would also be valuable in this field.